Some readers may look back with a certain fondness upon their youthful pastimes, such as the role-playing game Dungeons & Dragons, which allowed players to imagine an existence in a sword-and-sorcery setting under the controlling eye of a “dungeon master”, fighting all manner of impossible creatures in a hunt for treasure, weapons and spell books. Armed only with pencil, paper, dice of assorted geometries and a lead figurine marking the player’s position on the hexagonal chart paper of the dungeon, tens of thousands of teens and young adults shared in the common experience. Most important of all was the list of recommended reading that appeared in the introductory game modules, which served to introduce players to a number of written works – not just Tolkien and R.E. Howard, but older works such as Amadís de Gaula (the late medieval “book of chivalry”) and most importantly, The Book of Imaginary Beings by Jorge Luis Borges. 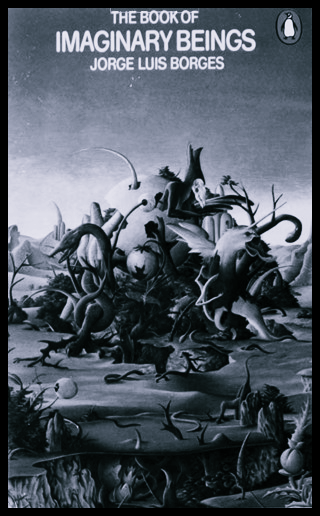 Inspired by the bestiaries of old, Borges – one of the leading authors of the 20th century – included creatures from different cultures and times, including fictitious beasts such as a reptile imagined by C.S. Lewis for Perelandra (second volume of his “Space Trilogy”). This illustrated collection of fanciful creatures included some with powerful roots in historic tradition, such as the Golem. Was the great Argentinean writer, poet, translator and critic aware of certain facts that led him to include this figure among the denizens of his Book of Imaginary Beings? The traditional image of the vampire – castle, expensive attire, medals and casket – is not readily associated with the Spanish-speaking Americas, although it figured prominently in a number of horror movie productions, usually involving Bram Stoker’s Count Dracula or his descendants having made the journey across the Atlantic for unspecified reasons that are not important to the plot. Mexico, perhaps, can boast of having seminal cultures that turned vampires into gods – among the most fearsome in any pantheon of the Americas. The Mayan god Camatzotz (“death bat”) was a terrifying entity sent down from the sky to behead the second race of men, created out of wood, since their condition did not allow them to venerate their deities. Worship of this bat-god spread throughout Mesoamerica, leading some to suggest that the giant vampire bat (Desmodus draculae) of the Pleistocene may have survived into historic times, prompting humans to consider it a deity to be feared and appeased. 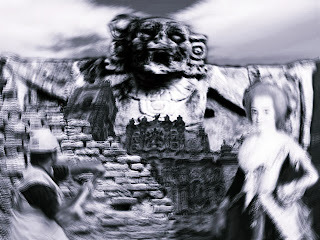 The goddesses collectively known as Cihuateteo also had vampiric qualities, wandering the night and attacking children, having themselves died in childbirth. But not all such entities can be consigned to the safety of myth and legend. A story has been making the rounds of the Mexican paranormal world for many years now. Efforts at finding its putative source (a radio broadcast from the early 2000s) have been fruitless, so it should be classified as hearsay or the ultimate FOAFtale. Nonetheless, it is sufficiently compelling to include in this essay on high strangeness and improbable entities. A nurse phoned a Mexican radio call-in show to describe – with considerable trepidation – an incident that allegedly occurred in 1977 at a very specific location: The Hospital Civil de Guadalajara’s specialized medicine unit. 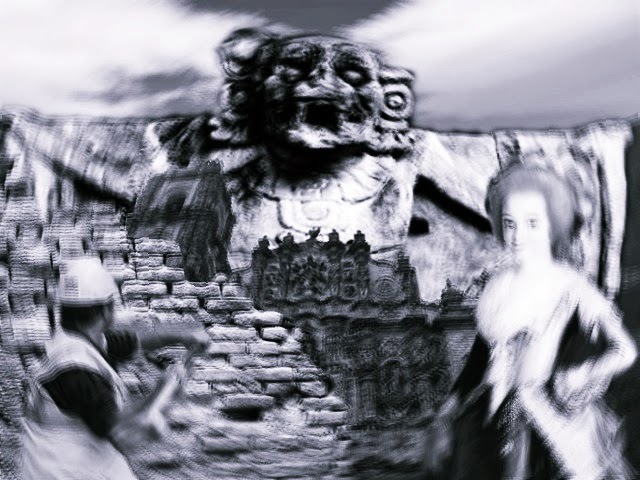 While workmen took their sledgehammers to a wall as part of a remodeling project, they were shocked beyond belief to see the old masonry crumble to dust, only to reveal the body of a woman immured since the colonial period of Mexican history, judging by her heavy and costly garments. Legends about “emparedados” (a word currently for sandwiches, but employed in the 16th century for the cruel practice of burying victims behind walls, literally walling them in while alive) are common in the chronicles of Viceregal-age Mexico. In such stories an old wall crumbles by design or accident to reveal the skeleton of a family member punished for disgracing the family or a number of other reasons. It has also proven a popular fictional device in classic works of literature such as The Cask of Amontillado by Edgar Allan Poe. The difference in this case is that the immured woman was apparently alive. Stretching the limits of credulity to their most threadbare, the nurse said the woman’s body was free of any corruption, perfectly preserved in a glass case. The laborers and their foreman were shocked beyond belief, as were physicians and nurses who flocked to see the phenomenon – but their amazement and even cries of “¡milagro!” (a miracle) that may have briefly filled the air were stifled by the fact that an adorned wooden cross had been driven into the woman’s heart. The only other bit of tangible information was that Dr. Mario Rivas Souza of SEMEFO (Servicio Médico Forense, the Mexican medical examiners’ unit) had been a party to the mind-bending event, having been the senior administrator who dealt with the four clergymen sent to handle the situation. A search reveals that Dr. Rivas was in fact affiliated with that clinical branch at the time of the alleged event, but had not practiced medicine at the hospital since the 1960s. Further sleuthing suggests that the event – if there is any truth to it – would have occurred not in the gleaming tower of the Hospital Civil de Gualajara but in the “Hospital Civil Viejo Fray Antonio Alcalde” – the single story building on Coronel Calderón street, whose construction began in the year 1788 and completed in 1794, adding another solid detail to the incredible story. Nor is this the only sample of vampire lore coming out of Guadalajara: the narrative of the vampire buried under a tree in the city’s Panteón de Belén cemetery is widely known and has acquired international standing. For a more tangible Latin American vampire story we must go to Perú, where the citizens of Pisco are split between veneration and fear over a tomb in the city’s old Beneficiencia Pública cemetery. It houses the remains of Sarah Ellen, a migrant to South America who died over a hundred and fifty years ago. The place housing her mortal remains became notorious when it was among the few structures in the cemetery not levelled by a 7.9 earthquake in 2007. Part II in this series continues tomorrow Saturday, February 22, 2014.